Hello and welcome to another newsletter. Hello again. Sorry this newsletter is so late. I am still finding it hard to sit down and work on the website due to my back problems. However, I have finally managed to do the report from the MBCV Concours weekend, it appears below. Also in this newsletter is news of a Ponton get together in Poland, and a special link of the week. - As advised in the e-mail that told you about this newsletter, you need to SUBSCRIBE to the new website to receive the newsletter in the future. Only 50% of the original list of people who received the newsletter on the old website have subscribed. We could continue to notify you all on the old system but it is rather labour intensive and defeats the whole point of spending the time to write a semi automated website. - For those people that have registered on the new website, if you wish you can change your email address or password by loging on and clicking "Edit My Details"
The pictures have all been put on the server from the old site. I am going to be using this space to upload all of the pictures I have, (there are thousands of them). One of my pipe dreams is to come up with some method of letting customers find a picture of anything Mercedes at the push of a few buttons..... 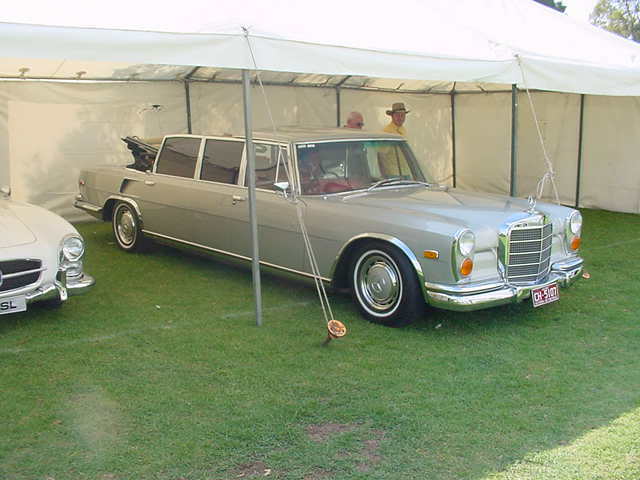 Meanwhile here is my report from the Mercedes-Benz Club of Victoria Concours. 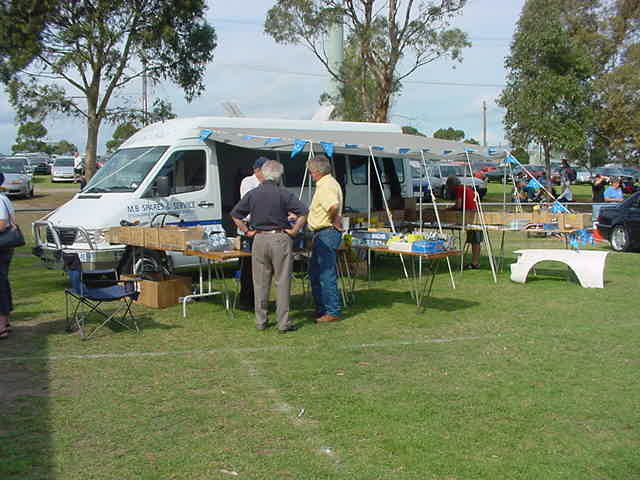 This years Concours was held in conjunction with the AOMC European and British day at the Dandenong show grounds. The event was a resounding success with more cars than I have seen at a Concours for many years. Not only was there quantity, but there was also quality, and not just among the cars presented for judging. There were some real gems parked here and there. As usual Noel Harding and Wayne Fitzgerald were there in fierce competition with their 190SL's. There were also rows of W111 coupes, heaps of Roundies, plenty of Pagoda's and a great 220SE Roundie Cabriolet. A Campervan conversion company brought along a sample of there new model based on the MB100 van and Three Point Motor brought along the Vito 112CDI that was used for driver transport at the recent Melbourne Grand Prix. Here is a shot of my 412D camper van. I used it to transport all my stock there for the trade display. There was also an interesting trade display from Continental tyres. The Van performed faultlessly for the trip and clocked over 400000kms as I drove onto the Dandenong show grounds where the Concours was held! I was tempted to enter it in the Commercial vehicles class but didn't when a guy turned up with his Mercedes Tractor! Apart from Cars and trade displays, the MBCV also had a restoration display for the public to view. 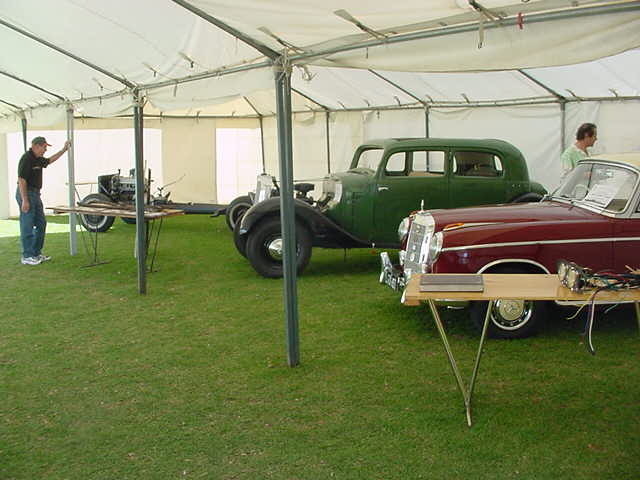 In the tent was my fathers immaculate 1960 220SE coupe, his partially restored W143 230 sedan from 1937 and the chassis of a friends 1955 220 Cabriolet. There were two companies displaying their restoration skills as well. Scott Mahoney from Metal Master Panels was working on one of the front guards for the 220 cabriolet and Rob Brewer from Carwood was displaying his timber restoration techniques. The Outright winner was Lindsay and Angela Miller, with their 1955 220a. Regular Newsletter readers will recognise this as the car that was featured awhile back in Newsletter 38. We had a large input into the restoration of this car and were very happy when it also won the "Best Professional Restoration" award as well. The next day the MBCV organised a tour of some of the local car collections in Melbourne. The shots above are from George Hetrell's collection. Both are taken from the loft of the barn where he keeps his cars. It is an amazing collection with two very notable cars. A 1896 Benz Velo and a 540K. Both are immaculate and are used regularly by George on various Classic car runs. George also has his own adult size train set that runs on a kilometre loop through his own personal botanical gardens! You can just see the carriages on the left of the left hand picture above. There were plenty of big kids lining up for a ride! Next stop was Nereo Dizane's collection. 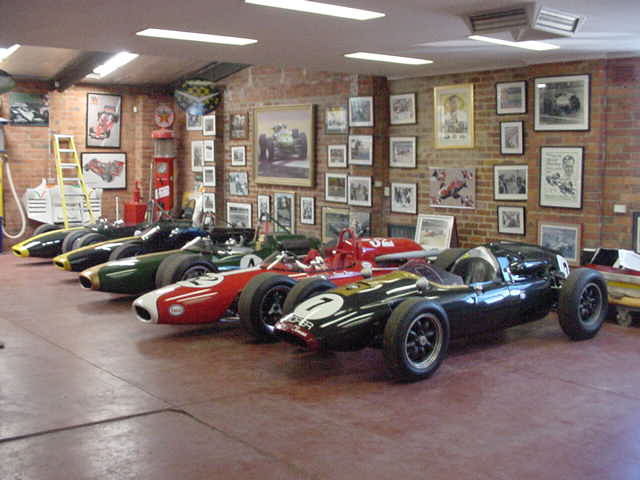 Apart from two Benz's (note these are not Mercedes-Benz's) and a 170Da Ute , he also has the worlds largest collection of Brabham race cars! The red one is the car that Sir Jack raced at Indianapolis. All of them have been restored and see regular action at Historic Race days. One of them even did a few display laps at the recent Melbourne F1 Grand Prix. Most of those posters and pictures on the wall behind the cars are personally signed by Jack! His mechanic owns the Carter Corvette, this is a famous Historic race car that was originally built by Murray Carter. Then onto the final stop for the day. The Fox Museum workshop and display rooms. 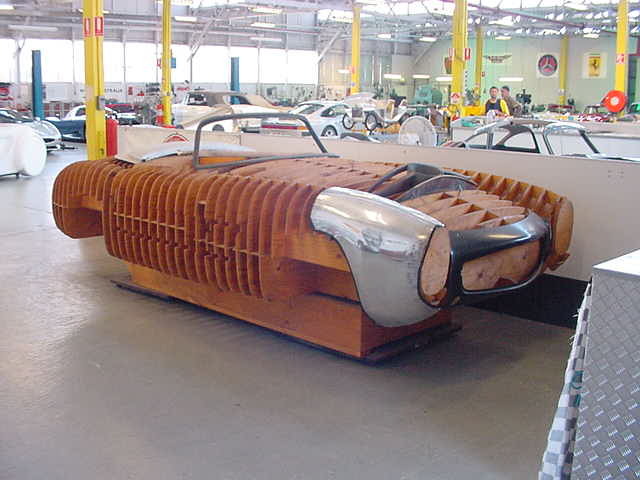 Yes that is a 1:1 scale timber buck for a 300SL roadster. On the wall behind the car was an original 1:1 scale blueprint for the same car. This place is just amazing. Lindsay Fox has the largest collection of 300SL's outside of the MB Classic centre. 4 Gullwings and 5 Roadsters to be precise. Once again all of the cars in this collection are usable, not just museum pieces. Some of them are used for charity days to give kids with Cancer a thrill. Like this Porsche 959, the Jaguar XK220 or one of the many Ferrari's I saw there. One of the Gullwings has just got back from the paint shop and was having all the refurbished parts put back on. The display rooms are in the old Victorian Government Mint building. (the vault with meter thick walls is still there) Here is housed one of the worlds most impressive Mercedes-Benz collections. There are so many striking cars that it is hard to know where to start. Here is Ringo Stars old 600, a beautiful 170S cabriolet, a pre-war 200 cabriolet, an amazing 280SE 3.5 cabriolet and another 540K. Given that I saw two of these magnificent cars in one day you would think that they are common, however the 540K is one of the most desirable collector cars in the world! This car was originally owner by German Ambassador to England, hence it is a right hand drive version. Overall this was an amazing weekend of friendship and cars. I would personally like to thank the MBCV and their organising committee for the work they did to put this weekend on. As usual it was a roaring success. I would also like to add that if any of you Newsletter readers think that Car clubs are boring, I hope this changes your mind. Unfortunately I have put my collection of LWB sedans up for sale. Me recent problems with my back have forced a bit of a rethink on my plans for these. You can click here to check out a page that has all the details. Two new cars this week. Last Monday we had a W116 280SE booked in for an engine rebuild. It is quite a nice car but the engine is just worn out. You know the joke about a smoke screen like James Bond? Well this is that car. Anyway when the owner tuned up with the car he took one look at the 87 300E and decided that a new car was a better alternative than a new engine (and a lot more fun). So as a result we have a 1976 280SE to be dismantled, one unusual feature of this car is that it has a Cream leather interior! Obviously the engine is worn out but the rest of the drive train is great. We also have purchased yet another illegal import 190E. 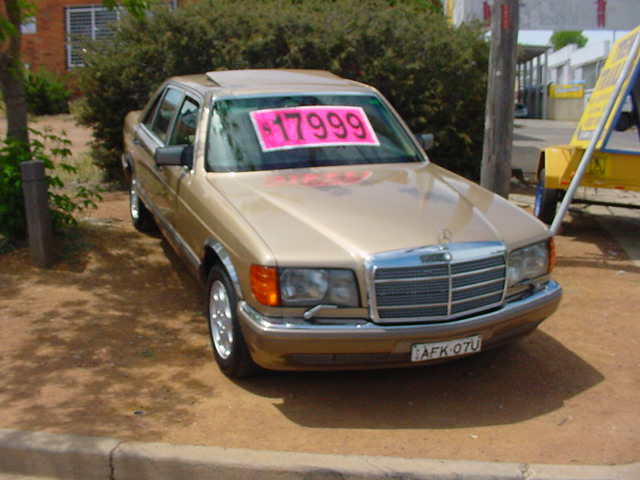 This one is a 1983 model and unfortunately is only in reasonable condition. 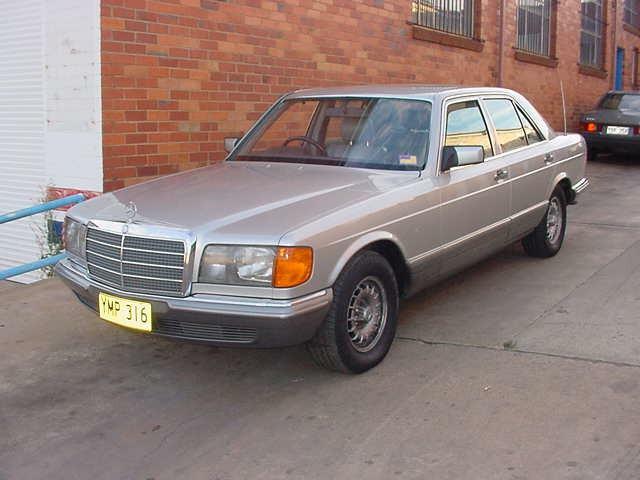 So between this car and the one reported on in Newsletter 55, we now have plenty of 190E parts. 260E 89, sorry didn't even get to take some pictures of this one. 420SEL 86, we sent this car off to the detailers and thought that they had given us a different car back! 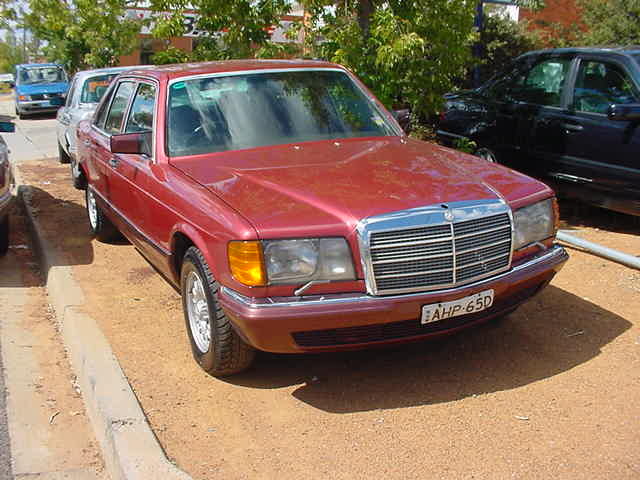 230E 1986, only 153000kms, full MB dealer log books. White with blue cloth, alloys, etc. Not often you see a 190E with under 100000kms these days! Great little car only 93000 kms. Ivory cloth interior, electric windows, external temperature gauge, rear headrests, long ACT rego. This car is currently featured as car of the week on the website. Great little car only 166000 kms and good history. Latest style Becker radio, long NSW rego. Grey MB-tex interior.